Whether you’re building a new home or just replacing your roof, the design of the roof can greatly impact the practicality and aesthetic appeal of your home. Here are 15 traditional and modern designs to help you decide on the best type of roof for your home. Gable roofs are some of the most popular roof types, it’s a traditional style that is easily recognizable by its triangular shape formed by the slant of the peak. Pros: Gabled roofs are great if your home is in a region that gets lots of rain or snow, because the triangular shape allows for everything to easily slide off of your roof. A gabled roof allows for more ventilation and can also provide more space for an attic, an extra room, or vaulted ceilings. The simple design is easier and cheaper to build compared to more complex designs. Cons: Gabled roofs are more prone to damage from high winds and severe weather. If the frames do not have proper support, the roof can collapse. Material can be peeled off from strong winds, and if there is too much of an overhang the whole roof can be blown off. A hip roof is a classic roof style that is sloped on all four sides and forms a ridge at the top of the roof. Pros: The slopes on all four sides makes the roof more reliable and sturdier than a gable roof. They are also great for regions that experience strong winds and heavy snow. You can also add a dormer or crow’s nest to create more living space. Cons: Hip roofs are more expensive, due to the more complex design that calls for more material. Adding a dormer increases the risk of water leaks forming in the valleys created from the additional seams. A gambrel roof is a conventional barn style roof that has two sides and two slopes. The lower slope has a very steep, almost vertical slope while the upper has a milder slope that angles into the ridge. Pros: The gambrel style provides more living area— you can use it as an attic or convert the space into a loft. The design is fairly simple and doesn’t call for a lot of material, so it’s a relatively inexpensive build. Cons: This roof will not hold up well in strong wind or heavy snow regions, it can collapse from excessive snowfall or severe weather. Windows installations are a pro and a con; windows can enhance the value and beauty of your home, but they also increase the risk of leaks. The mansard roof is a traditional french style roof with four, double-sloped sides that form a low-pitched roof. The lower slope is steeper than the upper, and the sides can be flat or curved. Pros: This roof also provides more living space— this space can easily be used as an attic or loft. This style is also ideal for dormer additions. Cons: The low-pitched area of a mansard roof doesn’t handle heavy snowfall very well. The are also more expensive due to the design and the materials needed, but the potential for additional living space might make up for the initial cost. Bonnet roofs are basically the opposite of Mansards; they are double sloped like Mansards but the upper slope is steeper than the lower slope, with the lower slope hanging over the sides of the house. Pros: The overhang acts as an excellent shade cover for a porch or patio area, and the space created by the upper slope can be easily converted into an attic or loft; you could also install vaulted ceilings and add windows or a dormer for more natural light. The lower slope provides extra protection from water leaks and damage to the exterior walls. Cons: This roof has a more complex design that requires more material and is harder to build, which makes it more expensive than other roofing options. The Saltbox is a traditional style that combines the Skillion and the Gable designs; it has asymmetrical slopes, with one slope being only slightly pitched and the other steeply pitched, ending in gables on each side. This style became popular in early Colonial America, because it was a simple way to add more rooms to a home. Pros: The steep slope allows for easy water runoff, so this would be a great option for heavy rain regions. 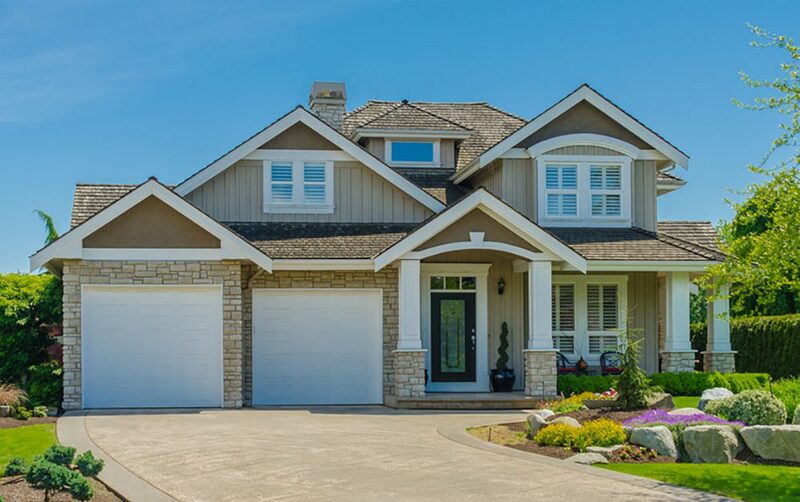 This style is sturdier than a traditional gable roof, and the asymmetrical design adds more rooms to your home, most designs have two stories in the front and one in the back. Cons: You may be able to have more rooms with this design, but some of the rooms will have steeply slanted ceilings, making it harder to move around in that space. This is a type of hip roof, but there are no vertical sides or gables, all sides converge to a pyramid point at the top. This roof is usually used for smaller structures, like a carport or gazebo, and storage buildings. Pros: The Pyramid is very wind resistant, and the extra space it creates can be used as an attic or loft area. Cons: The difficult design makes this roof a more expensive option. Flat style roofs don’t have a peak, and are slightly pitched to allow for rain runoff and drainage. Pros: Flat roofs have potential as an extra living space, such as a rooftop patio or garden. You can also hide your heating and cooling units with a flat roof style. This design is easier to build and less expensive, and solar panels are easier to install on a flat roof. Cons: Because of the low-pitch, flat roofs are more prone to water leaks and damage, so if you live in an area that experiences heavy rain and snowfall you might want to consider other options. The initial cost of a flat roof is less expensive, but the maintenance and repairs might make it more expensive over time. This is also known as a shed or lean-to style roof, it has one single slope that is pitched in one direction. Skillion roofs are usually used for storage or other types of additions, but they are becoming a popular, modern-style roof option. Pros: This roof style is pretty easy to build, and doesn’t require much material. Because of the steepness of the pitch, rain and snow will easily run off, so this is a great option for heavy snow and rain regions. The design is also aesthetically pleasing, lending to its increased popularity. Cons: This roof will greatly decrease or eliminate the possibly for an attic space, and the steepness of the pitch can affect ceiling height. They also may not hold up well against strong winds. The Jerkinhead is a mix of a gable and a hip roof, it features the traditional triangular shape of a gable roof with clipped or hipped ends. Pros: Clipping turns the point of the roof down, which makes it more stable than a traditional gable roof. The clipped points are more durable than the traditional overhang against strong winds. The higher pitch provides better structural support, and creates more living space. Cons: The difficult design makes this roof a more expensive build. The butterfly roof is a more modern design that has two slopes that converge in the middle, like a V.
Pros: This roof can also become a more eco friendly option, solar panels can be easily installed and a water collection system can be easily set up for the midsection. Larger windows can be installed under the higher slopes for more natural lighting. Cons: Due to the design, the initial upfront costs and the overall maintenance will be more expensive. Waterproofing is essential for this design, as clogged drainage or water collection systems can eventually cause the roof to collapse. The curved roof is similar to the Skillion, except the roof is curved out over the edges. The curve can be slight or form an arch over your home, depending on the design. Pros: This is a more modern, aesthetically pleasing style that has lots of versatility. A curved roof can be designed to fit well with most regions, from a slight curve for strong wind regions to more of an arch for areas with heavy rain and snowfall. Cons: The cost largely depends on the design, but using metal material will decrease the overall maintenance of a curved roof. This modern roof style is made of two or more alternating sloped roofs, which gives it the signature saw blade profile. This is another roof style that was traditionally used for commercial buildings, but has become a rising popular choice for modern homes. Pros: Windows can be installed in the walls of the roof, which can provide more natural lighting, and there is also potential for a loft area or vaulted ceilings. This roof is also more suitable for eco friendly additions, such as solar panels or a water collection system. Cons: This is another more expensive option, because of the design and the higher maintenance involved. The alternating slopes and window additions increases the likelihood of leaks. Dome roofs are becoming a popular choice for homes because they are usually more eco-friendly, and sometimes you can get them prefabricated. They are usually seen on smaller structures like gazebos or a crow’s nest. Pros: This type of roof is long-lasting, and the design is aesthetically pleasing, so it will enhance the overall beauty of your home. Cons: Because of the design, constructing a dome roof can get expensive. But there may be prefab options available, depending on the structure of your home. A combination roof utilizes multiple styles for a unique design. For example, your home could have a gable roof but the garage has a pyramid roof, or you could have gambrel for your house with a curved roof over the porch. Pros: You can enhance the beauty and value of your home with a unique design, and it could be the most practical option for different sections of your home. Cons: Designing multiple roof styles is difficult and could require various types of material, so it will get expensive. This will also add more valleys and ridges to the roof, which increases the risk of water damage. The most important thing to consider when choosing a roof is what type of weather your region experiences. For example, if you live in an area that experiences severe storms and strong winds, a gable or gambrel style might not be the most suitable option for your home. Other factors to consider would be whether you would like a more eco-friendly roof, or more attic or loft space. After you take these factors into consideration, you’ll be ready to choose the perfect roof for your home!